On September 17, 2011 thousands of women and men gathered in Zuccotti Park, located in New York City’s Wall Street financial district. It was a day when Occupy Wall Street (#OccupyWallStreet) movement was publicly born, gradually receiving global attention and spawning the grassroots protests against social and economic inequality all over the US. But how did this historic event actually start? The original protest was initiated by Kalle Lasn and Micah White, editors of Adbusters, a Canadian anti-consumerist and pro-environment magazine. The idea was to have a peaceful occupation of Wall Street to protest against corporate influence on democracy, a growing disparity in wealth as a result of neoliberalism, and the absence of legal repercussions behind the recent global financial crisis. They sought to combine the symbolic location of the 2011 protests in Cairo’s Tahrir Square with the consensus decision-making of the 2011 Spanish protests (Movimiento 15-M). 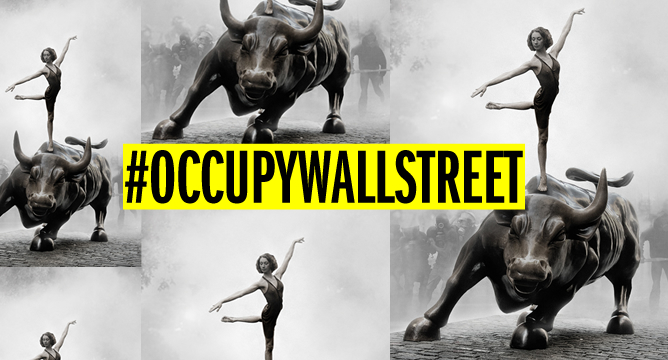 On June 9, Adbusters tweeted its subscribers “America needs its own Tahrir acampada. Imagine 20,000 people taking over Wall Street indefinitely”. In mid July, as Adbusters‘ senior editor Micah White told, they floated the idea via their email list and it was spontaneously taken up and it quickly spread online with help from the hacker group Anonymous. See, and feel, below (pasted from the Adbusters website) the full text of this inspiring message — the original email that sparked Occupy Wall Street movement and defied the (corporatized and financialized) world. Yes, Zuccotti Park encampment was dismantled and demonstrators were dispersed. But I am certain that Occupy Wall Street was not just a moment in history; rather it was the movement of history, it is history in the making. The beauty of this new formula, and what makes this novel tactic exciting, is its pragmatic simplicity: we talk to each other in various physical gatherings and virtual people’s assemblies … we zero in on what our one demand will be, a demand that awakens the imagination and, if achieved, would propel us toward the radical democracy of the future … and then we go out and seize a square of singular symbolic significance and put our asses on the line to make it happen. The time has come to deploy this emerging stratagem against the greatest corrupter of our democracy: Wall Street, the financial Gomorrah of America. On September 17, we want to see 20,000 people flood into lower Manhattan, set up tents, kitchens, peaceful barricades and occupy Wall Street for a few months. Once there, we shall incessantly repeat one simple demand in a plurality of voices. Tahrir succeeded in large part because the people of Egypt made a straightforward ultimatum – that Mubarak must go – over and over again until they won. Following this model, what is our equally uncomplicated demand? The most exciting candidate that we’ve heard so far is one that gets at the core of why the American political establishment is currently unworthy of being called a democracy: we demand that Barack Obama ordain a Presidential Commission tasked with ending the influence money has over our representatives in Washington. It’s time for DEMOCRACY NOT CORPORATOCRACY, we’re doomed without it. This demand seems to capture the current national mood because cleaning up corruption in Washington is something all Americans, right and left, yearn for and can stand behind. If we hang in there, 20,000-strong, week after week against every police and National Guard effort to expel us from Wall Street, it would be impossible for Obama to ignore us. Our government would be forced to choose publicly between the will of the people and the lucre of the corporations. This could be the beginning of a whole new social dynamic in America, a step beyond the Tea Party movement, where, instead of being caught helpless by the current power structure, we the people start getting what we want whether it be the dismantling of half the 1,000 military bases America has around the world to the reinstatement of the Glass-Steagall Act or a three strikes and you’re out law for corporate criminals. Beginning from one simple demand – a presidential commission to separate money from politics – we start setting the agenda for a new America. Post a comment and help each other zero in on what our one demand will be. 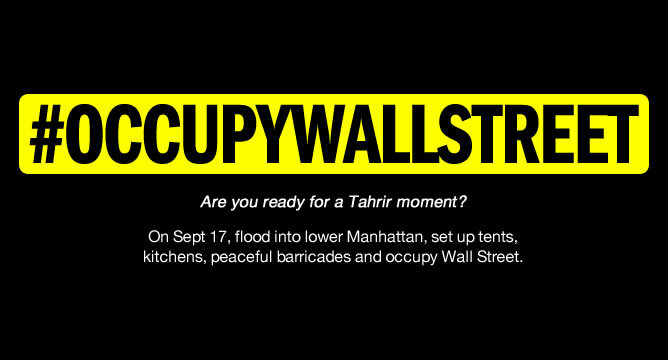 And then let’s screw up our courage, pack our tents and head to Wall Street with a vengeance September 17. This entry was posted in Books and tagged capital, capitalism, crisis, democracy, inequality, neoliberalism, Occupy Wall Street, public sociology, social movements, United States. Bookmark the permalink. Oleg. Thank You for archiving this. I hadn’t seen it before. That’s great and all, but I also remember when Dave Ramsey began his radio show back in 2008 to reach millions of people to help them in a positive way and get out of debt and build wealth. But that doesn’t get any attention. Why is that? Another ( obvious ) reason is that most media outlets are fundamentally disinterested in truly educating the public about how economics ACTUALLY operates in today’s world. Profit ( the false God ) ensures this tendency. Give a man a fish, you feed him for a day. Teach a man to fish, you feed him for a lifetime & build a social bond of some worth.